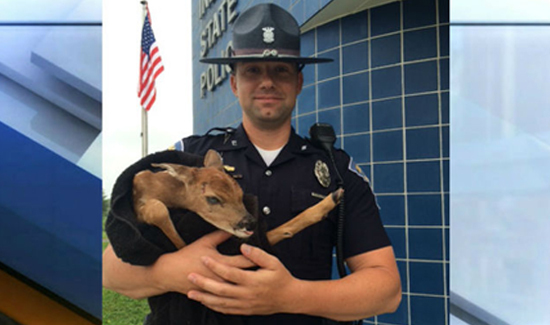 Indiana State Trooper Mike Wood with the baby deer he rescued after it became stranded on Interstate 70. THE STORY: At around 9 am on a recent morning, various motorists along Indiana’s Interstate 70 reported a “baby deer” in the median near the 48.5-mile marker. Callers said the baby deer was alive and appeared to be so young, that someone should check out the situation. Trooper Mike Wood of the Putnamville Post was subsequently dispatched to investigate. Moments later, Wood arrived and found the baby deer in the median and a deceased adult deer, most likely the mother, on the shoulder. The deer appeared to be only hours old and had what appeared to be part of the birthing process still attached. Wood was able to pick up the deer, place it in a towel, and transport it to nearby Curtis Wrecker Service, in Little Point, where employees assisted Wood with additional warm garments and minor hygiene necessities for the deer. During this time, Region III Dispatcher Leesa Slover exchanged several telephone calls with the Indiana Department of Natural Resources and other entities trying to locate assistance for the deer. The DNR and Slover were finally able to locate an animal rehabilitation center in Montgomery County that would take the deer. Trooper Wood transported the deer to a meeting location at US 231 and US 36 in Putnam County, where the deer was transferred into the custody of Melinda Poole of nearby Waynetown, Indiana. Poole holds all necessary permits and is authorized by the Indiana DNR to rehabilitate various wildlife. “The numerous calls undoubtedly set forth numerous activities which led to the safety of this deer. It was also heartwarming for all of us to play such a vital role in the health and well-being of this animal” Wood said.